By the time you read this post I will be on my merry way north of the border to bonny Scotland in search of a long weekend on the high seas. Well, high-ish seas: I’m off on a wee sailing trip with some pals and what better way to mark our maiden voyage than with some boozy treats you can eat and drink. Enter Valhalla Brownies. Shock horror, another recipe from my favourite Scandilicious baking book. I’ve made these tempting treats a few times now – for Fridays in the office; for my birthday and, well, just for the sake of having something nice with a cup of tea and every time they have been delicious to eat and fuss free to make. 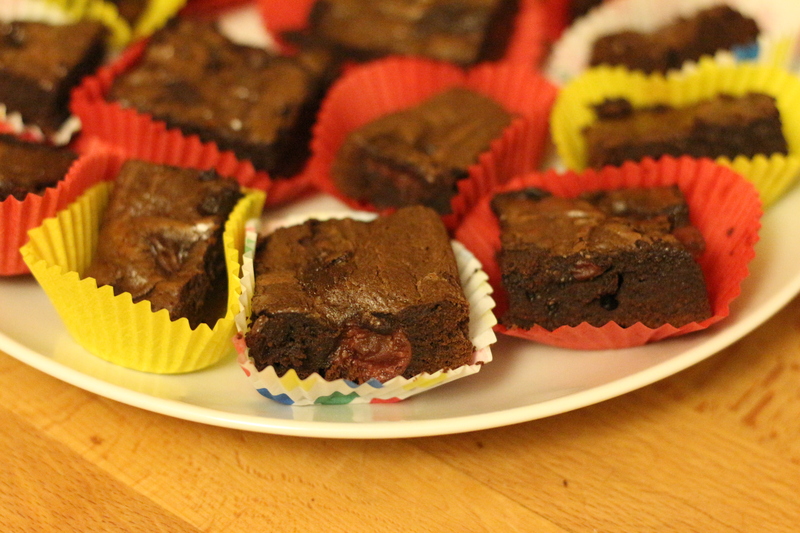 I think the secret to these brownies’ success is the addition of icing sugar. It clings to the chocolate and cherry liqueur in a way that caster sugar on its own can’t quite match. Not a great recipe for those who are watching their weight but I figure we’ll be getting a pretty good workout on the boat so we can afford to live a little on the food (and drink) front. 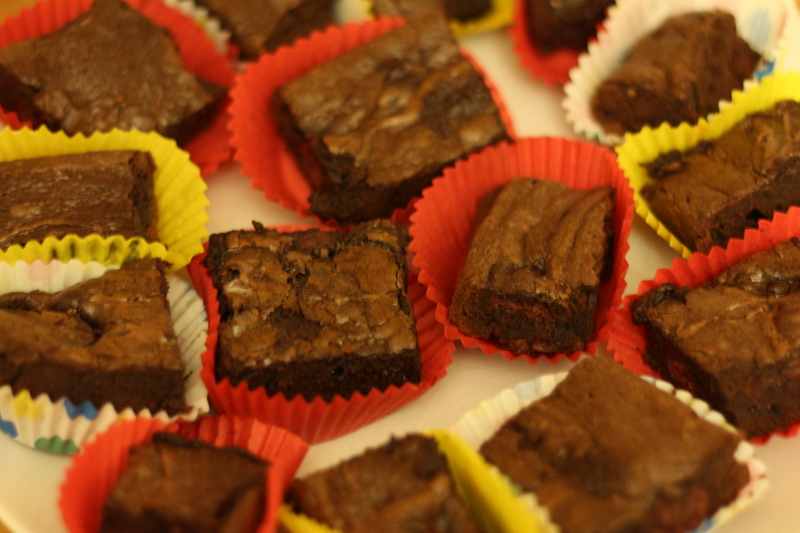 These are pretty rich brownies. The recipe claims to make 12 but I make the mixture stretch to around 35 brownie bites which are just the right size to satisfy my sweet tooth. The first thing you need to do is make a cross out of greaseproof paper and line your baking tray. This will make it easy to get the brownies out of the tin once they are cooked. 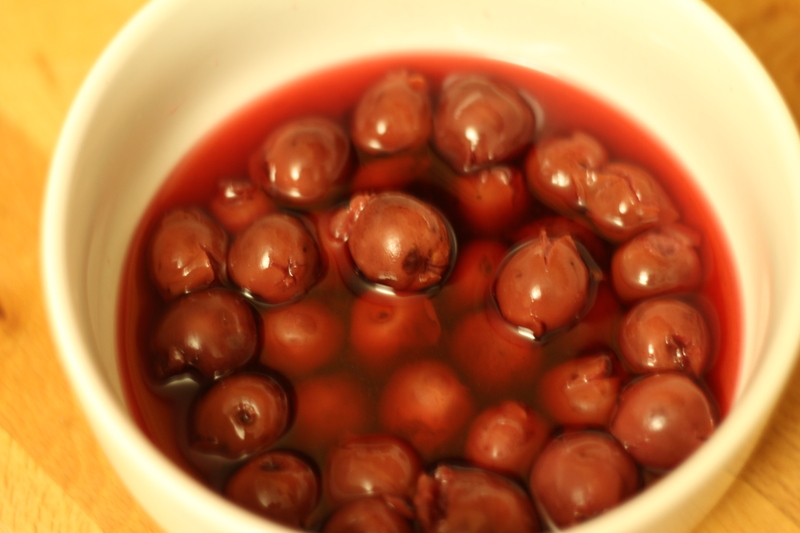 Put your cherries, cherry liqueur and lemon juice into a bowl stir and cover. If you can do this the night before all the better as this will allow the cherries to plump up and absorb the flavour of the liqueur. If you are short on time try to do this at least an hour before you bake them. Next you’ll need two bowls, one of which should be heatproof. In your heatproof bowl place your butter, chocolate and cocoa powder. You can either melt this in the microwave or over a pan of simmering water ensuring the water doesn’t touch the bottom of your bowl. I always think this is a bit of a faff and usually takes more time than I have to spare so more often than not I opt for the microwave option. In your other bowl mix your sugars, eggs and vanilla extract with a whisk for a couple of minutes until well combined. Once you’ve done this stir in your melted chocolate mixture with a metal spoon. Do the same with your flour until you can’t see any white bits at all. Finally, drain your cherries and stir them into your mixture. Don’t throw the liqueur syrup away as you can use this to drizzle on ice creams or other desserts. 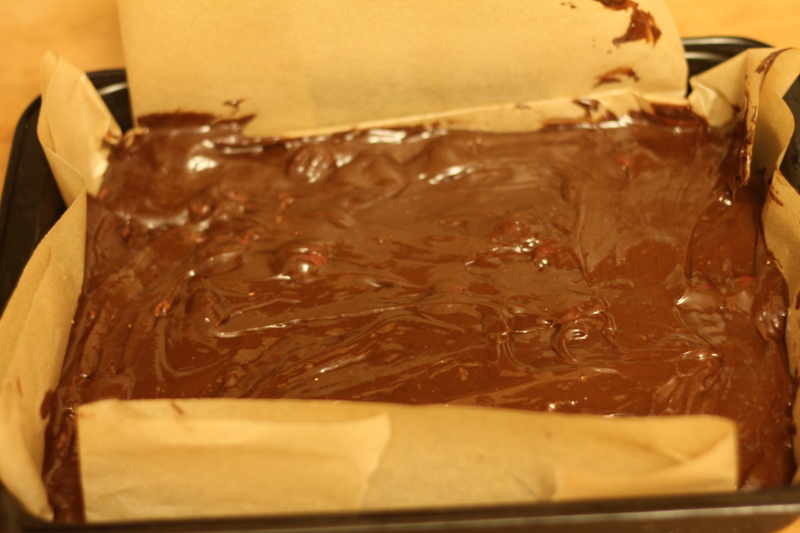 Once everything is mixed together pour your mixture into your baking tray and level it off with a spatula. 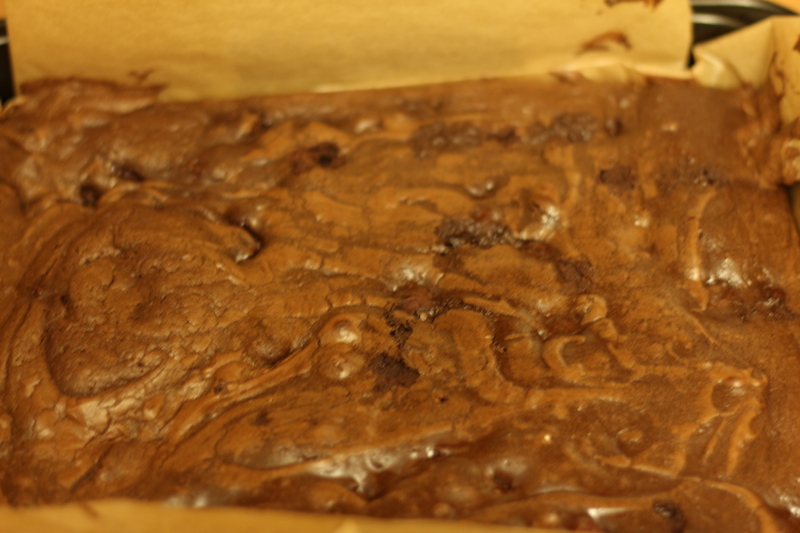 Pop into the oven for around 25-30mins until you can lightly pat your spatula (or the back of a spoon) on your brownie slab and it springs back a little. If the mixture sticks to the spoon or spatula leave it in a little while longer but keep a close eye to it. The trick is to take it out of the oven when it is slightly undercooked and leave it in the tin to finish cooking. When the tin has cooled completely transfer your brownie slab to a cooling rack and once it has cooled slice into whatever size brownies you fancy. Stored in an airtight tin or container these will keep for about a week – provided they aren’t all scoffed once cool! From experience these brownies are great for sharing; for getting to know new friends and an absolute essential for long overdue catch ups and salacious gossip sessions with people who know you all too well. Yum! These sound absolutely deee-licious!